The San Diego-based brand, The Baked Bear, chose St. Louis as the home of its 29th location, and their iteration on the ice cream sandwich is worth celebrating their decision to do so. We all remember the ice cream sandwich in its youth, average vanilla ice cream placed between two chocolate wafers, but the new creamery in town has reinvented the classic and turned it into a masterpiece. On arrival, you’re immediately greeted by a giant, illuminated bear covering the entire front window, and after walking through the front door into the quaint room, the West Coast style shines through with ocean blue detail and a laid back atmosphere. Stepping up to the counter, you get a sight of all the ice cream flavors and baked goods made fresh every day for premium taste and texture. The beauty of it is there are no rules. 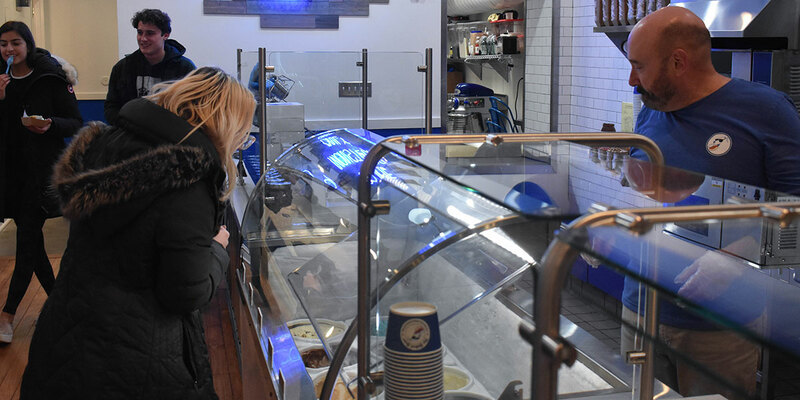 Select a brownie, doughnut or any combination of their dozen cookies to choose from, pair it with a selection of premium ice creams, top it with any and all toppings you desire and finish with the option to warm press your masterpiece to get a hot/cold, soft/crunchy bite. During my own visit, the vast number of possible combinations was a bit overwhelming, but my lack of decision-making skills was nulled by the fact that there was no wrong decision. I decided to get two sandwiches, in order to get the full experience of course, and chose to get one sandwich with M&M cookies, cookie dough ice cream, warm pressed and topped chocolate chips. The other had doughnuts for top and bottom, the signature bear batter (blue cake batter ice cream with fudge and brownie chunks), warm pressed and topped with fudge. The flavor blasting from all these ingredients was a treat like I had never had before and have craved since, but the thickness of the doughnuts made the sandwich a bit dry. On return, I would opt for getting cookies or brownies. Overall, the experience was extremely satisfying from arrival to getting the dessert, but being a very small restaurant, there were only about six tables inside and two outside. We got lucky in getting a table, but without one it would be difficult to eat the ice cream in hand without making a mess as it melted. While the lines can get lengthy, with our wait topping 30 minutes on the second night they were open, the wait was worth the quality of the product and generous hospitality. As we have now moved into the colder months and the creamery has settled in, the lines have shortened. 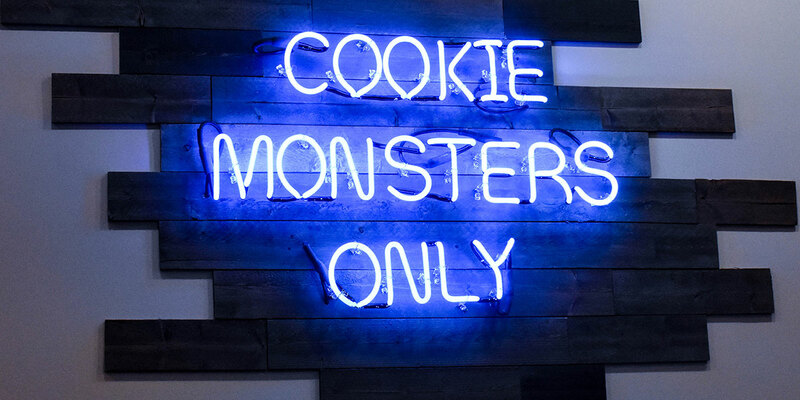 Location is ideal for The Baked Bear, being down the street from some St. Louis staple restaurants and venues such as Blueberry Hill, Salt + Smoke, The Pageant theater and more. Delmar Boulevard is also a hot spot for local college students being a junction between Washington University and Fontbonne University. With these multiple stops along the street, grabbing an ice cream sandwich can be the perfect finale after a night out on Delmar with friends and family, or a tasteful, unique date spot for local college students. With fantastic food and comforting atmosphere, I will undoubtedly be a frequent customer at this unique addition to the historical Delmar Loop, and I highly recommend taking a trip to The Baked Bear and creating your own ice cream sandwich, made perfectly to your liking.